Based on the acclaimed novel by Paul Bowles, The Sheltering Sky, published in 1940, was described by novelist Tobias Wolff as "one of the most original, even visionary, works of fiction to appear in this century". 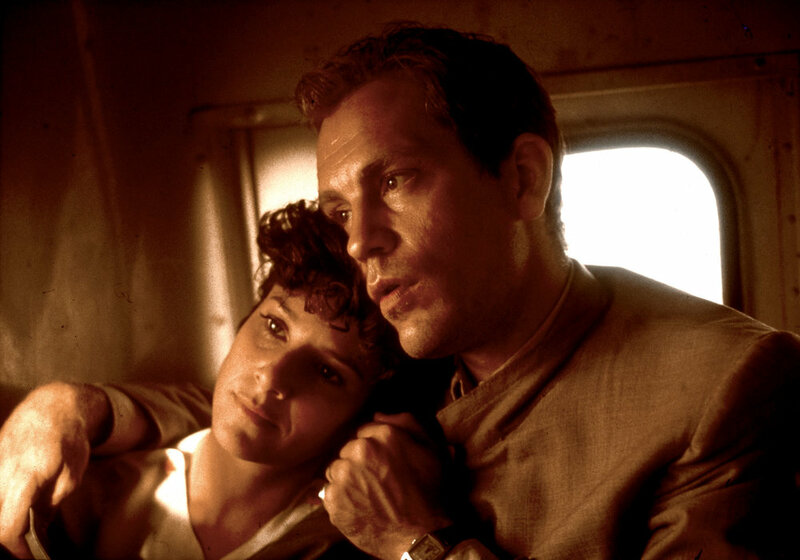 Port Moresby (John Malkovich) and his wife Kit (Debra Winger) arrive in North Africa in 1947. The sophisticated couple, married for ten years, are unable to live together despite their love for one another, and they've come to the African desert in search of renewal and personal inspiration. The stunning landscape filmed by master filmmaker Bernardo Bertolucci [THE LAST EMPEROR (1987)], serves as backdrop for the couple's attempts at reunion and their increasing emotional isolation. A musician who has not worked for a year, Port is uncertain of where he and his wife are going. Kit is weary of the constant traveling but continues to hope that by accompanying her husband, he will once again belong to her. Both remain determined to abandon the modern world and regain a clearer vision of themselves. WINNER: 5 awards including BAFTA for Best Cinematography, Vittorio Storaro, Golden Globe for Best Score, Ryuichi Sakamoto.